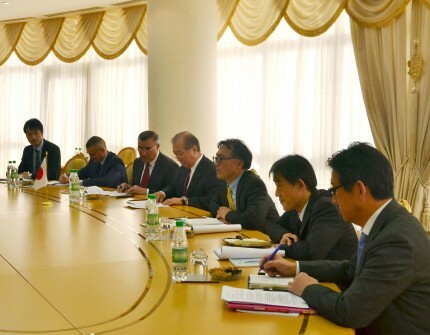 On the 21st of January 2019, a meeting was held at the Ministry of Foreign Affairs of Turkmenistan with the Japanese delegation that arrived to Ashgabat on a working visit and headed by the Vice-president of “ITOCHU Corporation” and Co-chairman of Japanese-Turkmen Committee for Economic Cooperation Mr. Yoichi Kobayashi. During the meeting, participants noted the high level of cooperation between Turkmenistan and Japan, particularly in the economic and cultural-humanitarian spheres. The issues of joint projects on provision of agricultural equipment produced by the “Komatsu” company were considered. Also joint investments in gas field and chemical industry were viewed in the framework of collaboration with the Japanese Bank for International Cooperation «JBIC». At the end of the discussions, the corresponding Protocol was signed. It is also necessary to note that high-level Turkmen delegation visited Japan in October 2018, during which the issues of further widening bilateral cooperation in trade-economic sphere were discussed.